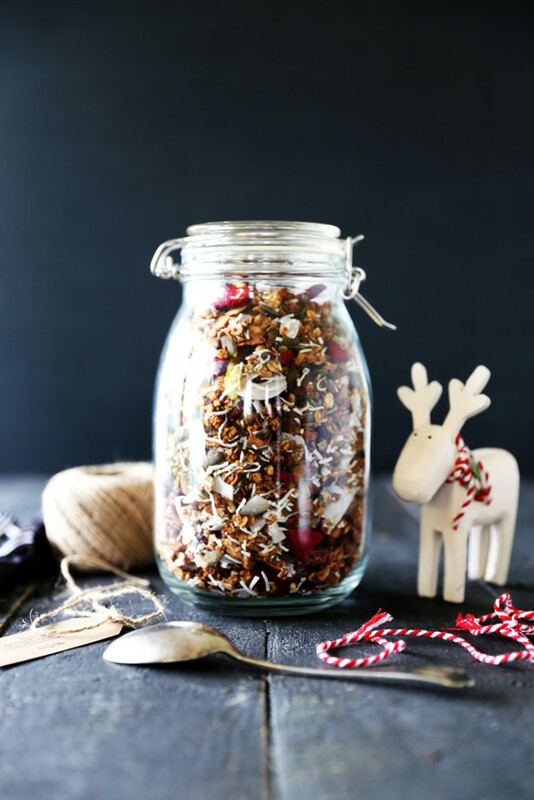 I regularly make a batch of granola each month, so as it’s December I thought why not make a batch of festive Christmas granola! When I think of Christmas the colours red, green and white come to mind so I tried to incorporate these into my original granola recipe by way of pistachios, cranberries, freeze dried plums and white coconut flakes. I added christmas spices to create that nostalgic Christmas smell and flavour, and while it was baking the house literally smelt like Christmas cookies! 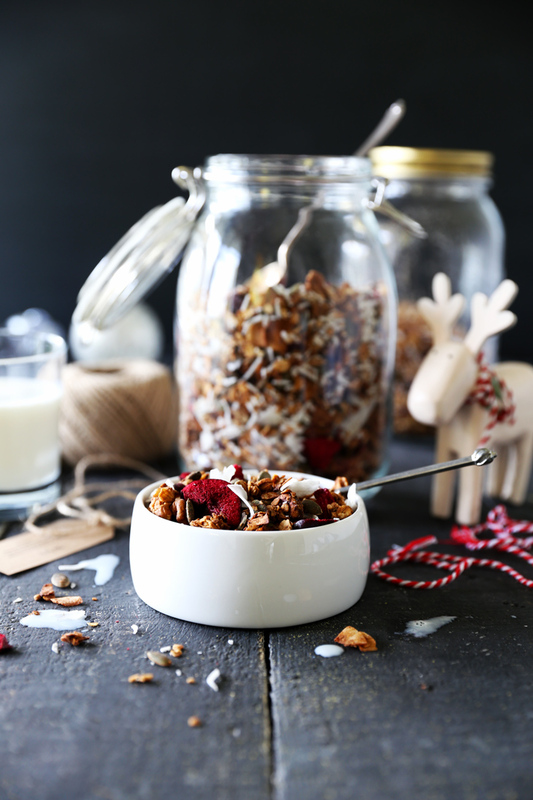 We have been eating this granola since the beginning of December and there’s nothing like starting your day with a bowl of Christmas cheer to put you in a festive mood. I think we’ll also be eating this granola on Christmas morning (although I suspect I will need to make another batch before then!) as the oats and nuts are nice and filling yet light enough that I know we’ll still have room for all the celebratory food ahead of us. This Christmas granola would also make a fabulous gift, especially for someone who appreciates handmade gifts. You could seal it in a cellophane bag and tie with a festive ribbon or even better, pile it into a couple of mason jars, tie some ribbons around the tops and attach a hand written label with the recipe on it. Any questions or comments about this recipe? Leave your comments in the section below, I love to hear from you! Preheat the oven to 160ºC and line two baking trays with silicone mats or baking paper. Gently melt the coconut oil by placing in a heatproof bowl over a pan of steaming water. Place the oats, pumpkin seeds, sunflower seeds, pistachios and walnuts into a large bowl. In a smaller bowl mash the banana and combine with the honey, melted coconut oil, cinnamon, ginger, nutmeg, cloves, allspice and salt. Add the banana mix to the oat mix and stir well to combine, then use your hands to rub it all together. Sprinkle the granola mixture evenly over the lined baking trays, then place in the centre of the oven to bake for 20- 30 minutes, stirring halfway. The granola is ready when it starts to colour, it will still be soft when you removed it from the oven but should crunch up as it cools. If not, return to the oven for another 10 minutes. Place the baking trays on cooling racks and allow the granola to cool. When the granola is cool enough to handle, add the cranberries, freeze dried plums and coconut flakes. When completely cold, transfer the granola to airtight containers and store at room temperature in the pantry. This granola will last up to 6 months if stored in an airtight container. Yeyy, a new (festive) reason to make some (more) granola! 🙂 Can’t wait to try it! 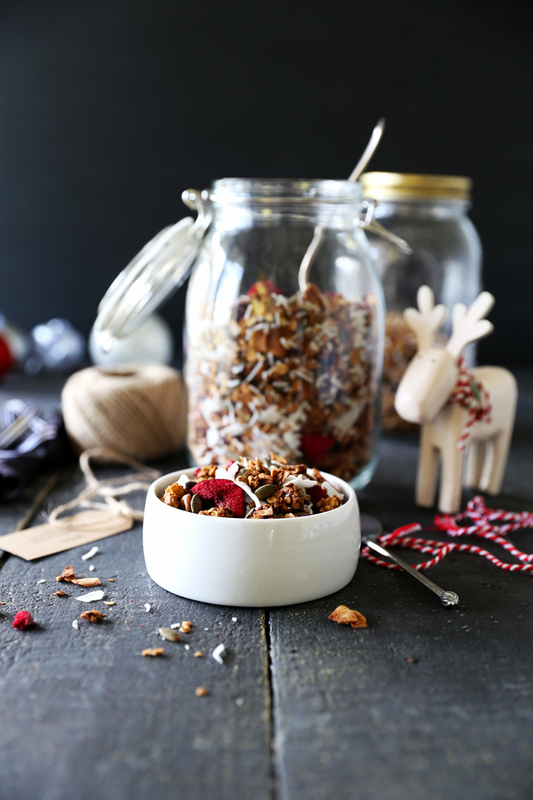 This granola recipe is so good, I made it for Christmas presents and everyone loved it!! So delicious and so easy.